During the 2018 TMTS show, representatives from Taiwan and Germany met at a forum event to boost the sharing of bilateral technologies as well as business opportunities in the smart machinery industry. 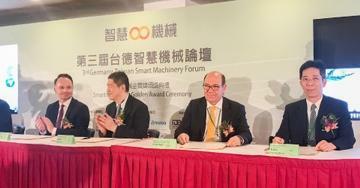 The 3rd Germany-Taiwan Smart Machinery Forum was held at the Taichung City Precision Machinery Innovation Technology Park by the Smart Machinery Promotion Office and the German Trade Office, Taipei. The achievements listed below were witnessed by Dr. Ming-hsin Kung, Deputy Minister of the MOEA, Dr. Thomas Prinz, Director General of the German Institute Taipei, Mr. Kuang-Yau Chang, Taichung City Government Deputy Mayor, and Mr. Axel Limberg, Executive Director of the German Trade Office, Taipei. Techman Robot Inc. and ATLANTA Antriebssysteme E. Seidenspinner GmbH & Co. KG, signed a MoU indicating that ATLANTA will be in charge of distributing Techman’s robotic facilities in Europe. Asia Pacific Elite Corp. (APEC) and Siemens AG signed a MoU indicating that APEC and Siemens will supply the needed software and hardware for collaboration on the digitalization of production lines. Manford Machinery Co. Ltd. and IGUS GmbH signed a MoU indicating that Manford Machinery and IGUS will engage in joint efforts to develop new technology for smart machinery implementation. Nearly 300 guests and audience members from Germany and Taiwan also witness the signings. The event's keynote speeches were delivered by representatives from major Taiwanese and German companies including Trumpf, Siemens, Advantech, Bosch, Toptek, IGUS, and AIDC.